Since I was a little girl I’ve been hearing about the adventures my oldest brother Danny had on his exciting 2 year trip around the world back in 1958! It’s what made me want to travel and have my own adventures. What a privilege it was, along with my other brother Randy, to be able to visit him in Thailand this past January 2015. We had the luxury of time together to reminisce and of course to hear his stories again – some stories I hadn’t heard before and some I knew but had gotten them mixed up in my mind. It was on the cruise that I got the idea of writing them out and putting them on my blog and that idea turned into making a little book for Danny to have and share with others. Here is the first blog. 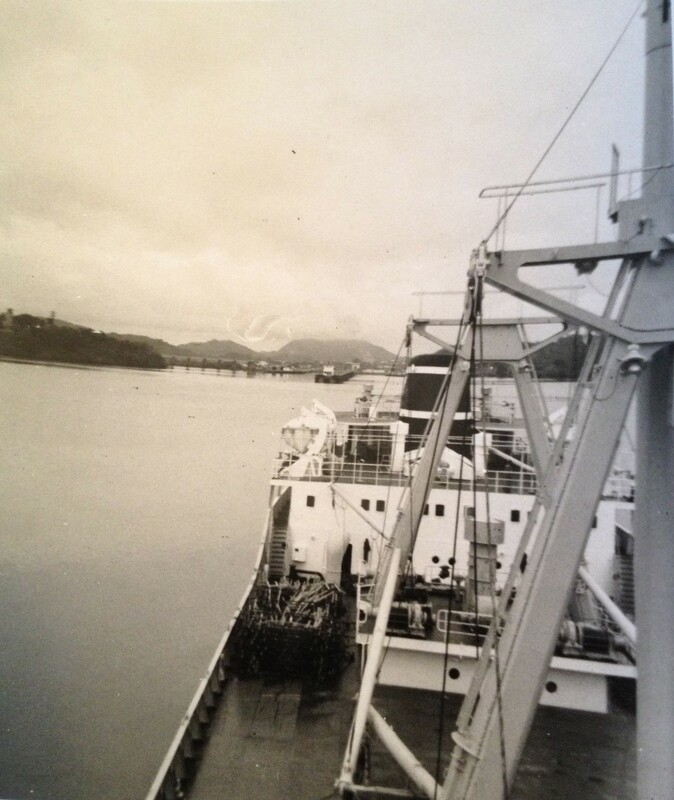 In May of the year 1958 an opportunity came up for my brother Danny to be an officer apprentice aboard the ship MS Carina in the Swedish Merchant Marine. He was 17 and in grade twelve with only a month until graduation, but this opportunity was too good to pass up. With Dad’s okay, (Mom had reservations) Danny and his friend John Richardson set off on a grand adventure with duffel bag in hand that included a record player and some 33’s to pass the time. Their first voyage was to England, a trip of thirty days. Danny’s job was to stand watch from 8 p.m. till midnight and 8 a.m. till noon, (second watch) where he learned the duties of a watch keeper and also to be a helmsman. His commanding officer was a Finish man who took a liking to him and taught him many things over and above just his job, and of course there were other duties as well, like scrubbing the deck white with holly stone. John got the job of Stewards Assistant for the officers mess. He had a split shift starting early in the morning to prepare for breakfast with a couple of hours break before repeating the process for lunch and then again for dinner. It made for a very long ten-hour day. John didn’t adapt as well as Danny to life at sea and was sick most of the time, sometimes with trays of food in his hands he would get sick over the side of the boat and continue on! Thirty days with nothing to look at but ocean and sky can get a bit boring and they were young. To pass the time on his watch, Dan would climb up onto the mast (this was forbidden) and look at the carpet of stars, he loved life at sea. Somewhere around the Panama Canal as he was getting off his midnight shift some of the other young shipmates thought to ambush him by dumping a bucket of ice water on his head as he came onto the flat deck of the ship between the bridge and the crews quarters. But it wasn’t Danny who rounded the corner that night, it was the Captain, a stern Swedish man who ended up getting drenched! Needless to say they were hauled into the Captains office and the instigator got docked a weeks wages, $12.50 – they were paid $50 a month (worth around $400 today) a lot of money in those days. So Jacqueline this is an interesting story. Lisa told me about it. Will Danny be publishing a book or it’ll stay a blog? Look forward to the next chapter – hope you’re doing well. I did make a book out of it for Danny already, gave it to him before he went back home. Also made a book of Randy and my trip to Thailand, a photo book that is, now I have to do one of Mike and I’s trip to Europe. Takes time to sort through all the photos and arrange, but so worth it. 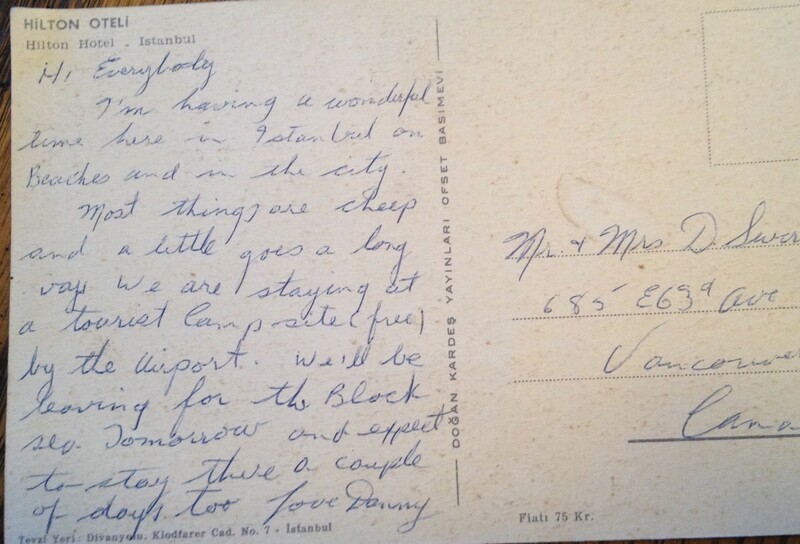 That picture of the postcard Uncle Danny sent you and Grandma and Grandpa is amazing! What a special photo to have! I thought it was appropriate as the feature photo. I like that he addressed it to me too since I was just a little girl at the time.